My brother knew something was up when our Mum approached him, handing over a crucifix and asking him to wear it, “…in case something happens.” Not normally one for flights of fancy, this seemed a little out of character, but certainly set the tone for the rest of the night. It was the 31st October 1992 and something was about to happen – something that changed the face of BBC policy for years to come. 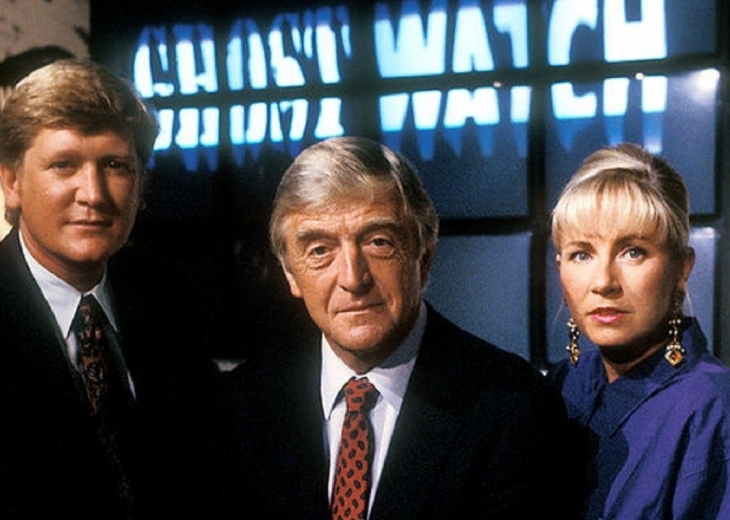 By now, there’s a good chance you’ve heard of Ghostwatch (1992). A feature length Halloween special taking the Saturday evening slot on BBC One. Presented by Michael Parkinson and Sarah Greene, with Craig Charles taking the roaming reporter role out on the streets of Northolt, Greater London. See, this isn’t your usual Halloween affair this, as Parkinson promises during the show’s opening, is a unique, live investigation of the supernatural. No creaking gates, no gothic towers, no shuttered windows. Yet for the past ten months this house has been the focus of an astonishing barrage of supernatural activity. Two young girls, Suzanne (Michelle Wesson) and Kim (Cherise Wesson) and their mum Pam Early (Brid Brennan), have been experiencing some seriously otherworldly phenomena. After being welcomed in to the television special, Parkinson introduces us, the audience, to witness a snippet of video footage of the two girls in their bedroom. While sleeping, the girls are awoken by the sound of loud banging, before items are thrown across the room, with Suzanne screaming that something is touching her before Pam rushes in to sweep them away. This is not the first time this has happened and, as Parkinson goes on to explain, tonight is the night where, under the scrutiny of live television, the BBC is launching an unprecedented scientific experiment where they hope to show you, for the first time, that ghosts really do exist. Joining him is Dr Lin Pascoe (Gillian Bevan), a parapsychologist who has been working with the family for some time to try and help explain things to the television audience. As Ghost Watch establishes itself and what we will expect over the next hour and a half, we learn that the Earlys are desperate for help. The house is often trashed, with blame falling on the protesting young girls, who deny they are to blame for anything. Dr Pascoe is clearly feeling sorry for them, while Parkinson agrees professionally. Eventually we reach Sarah Greene, then a big television personality, who is at the Early’s home on Foxhill Lane. One by one, she introduces the crew for the evening and we are shown the various gadgets and technology being employed to support the scientific study that will be taking place tonight. If you’ve ever seen Most Haunted, or any of the thousands of other paranormal television shows, this sequence will be very familiar to you. Indeed, if you ever watched any television specials, this format will feel eerily familiar – Chris Morris would certainly have been proud. As the show goes on, we are treated to short bursts of Craig Charles wandering the streets, to Parkinson’s earnest conversations with audience members calling in with their own ghost stories, and Sarah’s discussions with the family. We learn that Pam tried dismissing the sounds and disturbances in the house as the central heating – referring to “Pipes” being behind it. Sure enough, whenever Kim or Suzanne experience something paranormal, they claim that “Pipes” is here. See, if you’re paying attention, you will begin to notice more and more going on in the background of the show. Silhouettes, shapes and even glimpses of full on figures are teased and played with, and as the atmosphere darkens and evidence is gathered, the world begins to turn upside down. At around the 40-50 minute mark, things seriously start to take a shift. Physical evidence of water begins to emerge in the house, with louder and louder noises happening throughout the house. As Sarah struggles to hold the crew together in the house, Parkinson begins to get dismissive while Dr Pascoe grows ever more concerned over what she is seeing and hearing. The show quickly descends into chaos as the events in the house get ever more physical, with the sound of cats screaming somewhere deep in the walls. Pipes says we’ve got to stay! Pipes wants to see everybody! It’s no secret that Ghost Watch was, in fact, a fictional show. Written by horror writer Stephen Volk and heavily inspired by the famous Enfield Poltergeist during the late seventies (that happened to also inspire The Conjuring 2 (2016)), the format for the show emulates the famous War Of The Worlds radio broadcast that terrified the US public when it was broadcast as if it were a news broadcast. Just like Orson Welles’ production, Ghost Watch terrified the nation. Despite being broadcast during the BBC’s drama slot and cast lists being made public prior to broadcast, the inclusion of real life television personalities reinforced the idea that what was being shown was, in fact, absolutely true. The telephone number displayed on screen even took callers to a panel of real life parapsychologists, further encouraging the audience to believe what they were seeing. Some were so convinced that what they saw was real that an eighteen year old suffering from learning difficulties actually committed suicide, so sure that there was an afterlife. Likewise, a pair of young boys were found to be suffering post traumatic stress disorder following the broadcast – making Ghost Watch the first television show to ever induce PTSD in members of the audience at home. Following these reports, and hundreds of complaints, the BBC went on to ban the repeat broadcast of Ghost Watch for an entire decade. A DVD was eventually released in 2002, but the dramatic results of the show meant that the BBC would never again push the boat out on true terror – particularly on Halloween. Even watching it now, 25 years on, Ghost Watch provides some serious chills. Catching glimpses of the shadowy figure, dressed in black and covered in cuts and bleeding wounds is pretty scary, but the constant teasing and double-takes sewn into the plot easily outweighs the questionable acting and dated production value. It was so effective, in fact, that it was cited by the makers of The Blair Witch Project (1999) as a major influence.